This week the Dental Hygenist came to call. She told the kids that she wanted to check to see if everyone had the right number of teeth - but actually it's just for stats to see if the pre-school dental programs are effective. 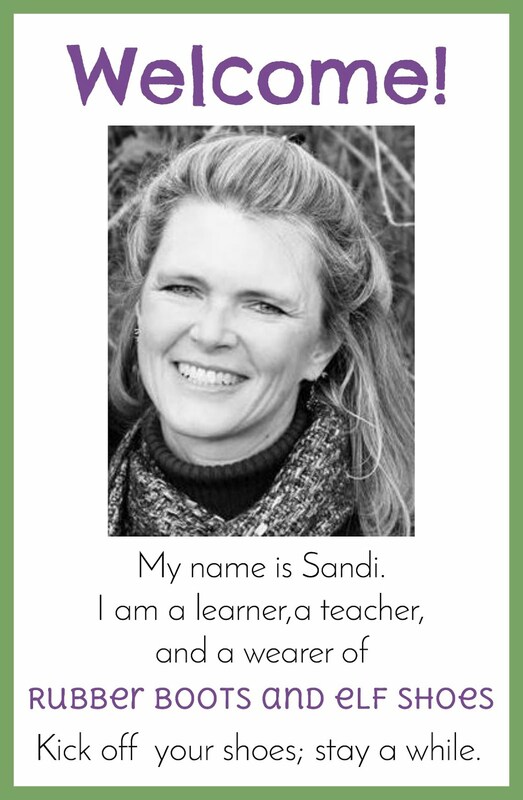 We use it as an excuse to talk about dental health and wiggly teeth. Wiggly teeth lead to discussion about the tooth fairy. We decide that there can also be tooth dudes. Equal opportunity tooth taking - treat leaving; it is the 21st century! And we learn that some countries have a Tooth Mouse. Once, long ago, atop an ancient cathedral in France, there lived a small mouse who would NOT go to bed. "Shush, cherie," said the roosting dove. "It's time to sleep." "But I'm not sleepy," said Sophie. 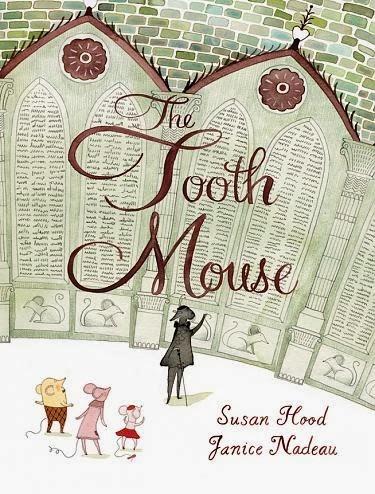 "I want to play Tooth Mouse…"
The Tooth Mouse has the total package: rich language and phrasing, delightful illustrations that invite us into the mouse world of Notre Dame Cathedral through each detail, an engaging main character, suspense and a satisfying surprise ending. Hood uses more sophisticated vocabulary and phasing than is typical in children's books today. The retiring Tooth Mouse needed to choose her "successor". 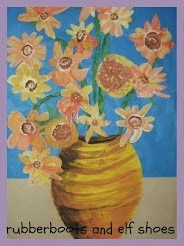 I was reminded of the Beatrix Potter books - written for children in another era. And it works. The language - and the careful sprinkling of French works removes us from the here and now, to a world where mice live in the grandeur of Notre Dame cathedral and are given tasks of courage, honesty and wisdom. Nadeau's ink line and watercolour illustrations allow the reader to feel the grandeur of Notre Dame without being overwhelmed. We see the spiralling staircase up into one of the towers - my students were very worried about the lack of a handrail. We follow the mice to the grand hall, beneath the stained glass window. 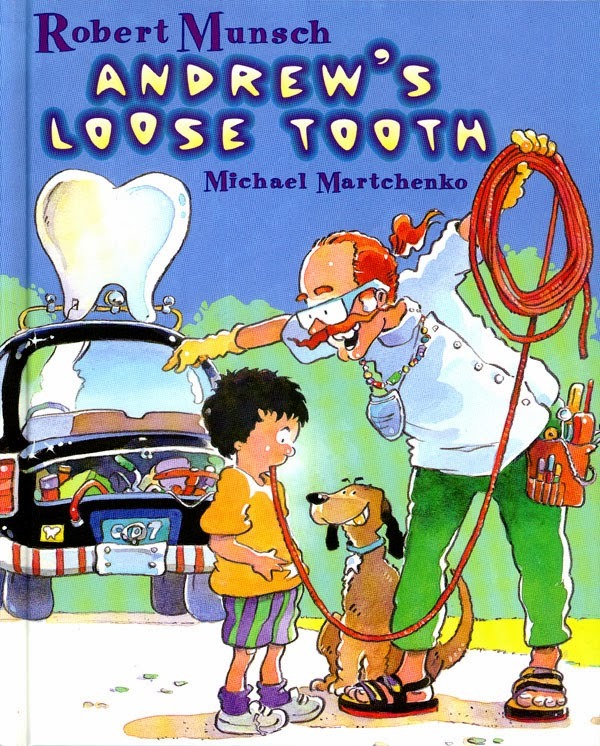 As a teacher, I loved this book because it was great for predicting and inferring. 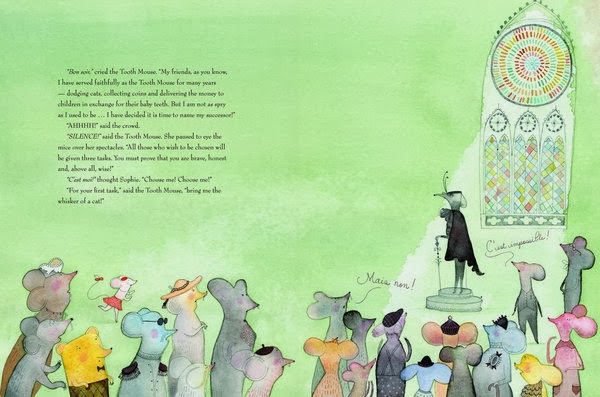 Why does the Tooth Mouse need to be brave, honest and wise? How are they important for the job? How can a small and tasty mouse remove a whisker from a cat? (Sorry a wee bit of a spoiler there.) What is written on the walls of the vault (illustration shown on the front cover). 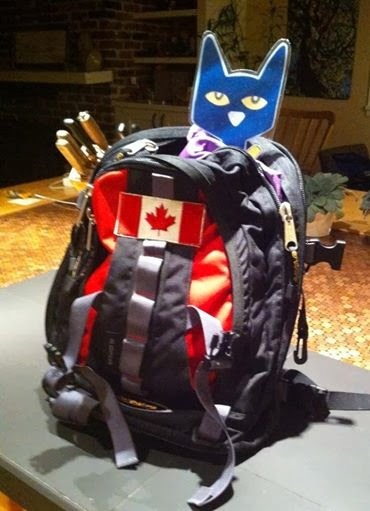 I'm not going to tell - but my students were able to figure it out within a cat's whisker. We spent over 20 minutes reading, examining the pictures, predicting and inferring. Pretty impressive. Sophie is a wee little mouse. 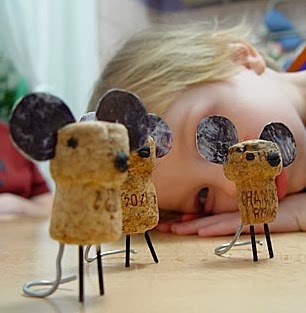 These cork mice from The Crafty Crow are cute enough to be Sophie-worthy. 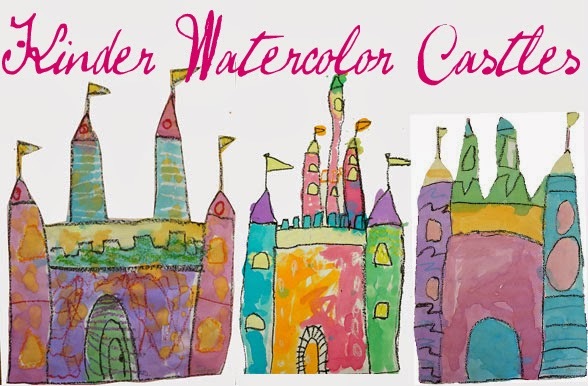 Patti from Deep Space Sparkle used line drawings and watercolours to make these beautiful castles with a group of kindergarten kids. The Tooth Mouse takes place in Notre Dame Cathedral in Paris. Go on a virtual field trip. My daughter and I are pretending to be gargoyles on the viewing level of Notre Dame. It was my mother's fault; she suggested it! 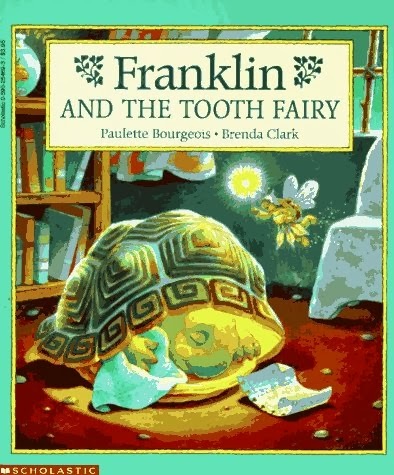 Enjoy other tooth fairy books. There are lots out there: these come kindergarten read and recommended. 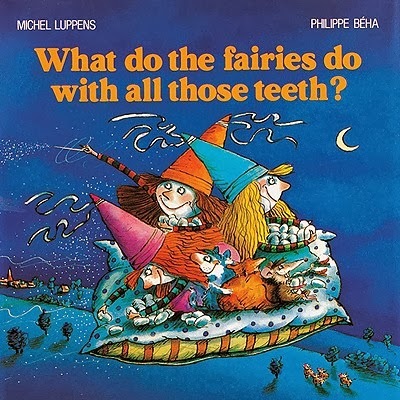 What Do Fairies Do with All Those Teeth? I find it interesting that many people think fairies' gender are female. Wouldn't they need to have male fairies to reproduce? Or is it magical? I'm commenting because I had a conversation with a male teacher when he asked me if the boys in my program liked going to Fairy Lane? I have never thought about the reproductive habits of fairies! Don't they find new baby fairies under toadstools?!? In kindergarten we have tooth dudes as well as tooth fairies. Seems to work for my boys. This sounds like a delightful book and I'm especially fond of mice. I really need to do a mouse unit:) I love those little cork mice. 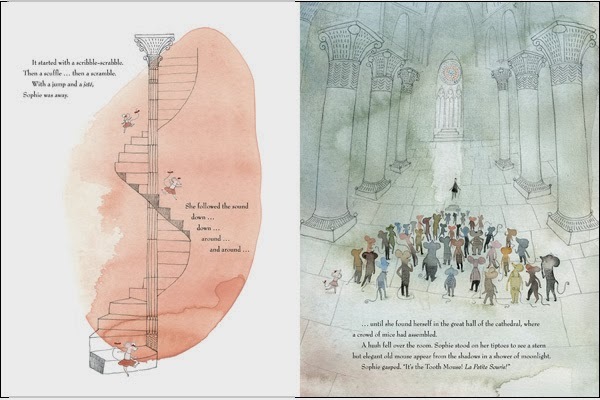 You would LOVE the illustrations. Too bad we were not close enough to share books! This looks like a really lovely book. Tooth Mouse? Who knew? I don't know that I would like the thought of a mouse crawling around under my pillow. When i lost teeth they just fell out on the floor somewhere and disappeared. Maybe the mice ate them. Maybe they left me a treasure and I never knew!! Those cork mice are pretty cute. Thanks for sharing! 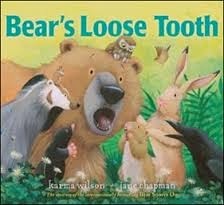 We read Bears Loose Tooth and a tooth fairy left him some blueberries. Maybe you were left a bone and just didn't realize it was from the tooth fairy!